All good things must come to an end, but in the unfortunate case of Little Tokyo’s b.o.s., judgement day has arrived far too soon. The nose-to-tail specialist opened back in October of 2013 after taking over a former izakaya inside the Honda Plaza that is home to the always busy Sushi Gen, ramen shop Men Oh, and intriguing shabu joint Kagaya. 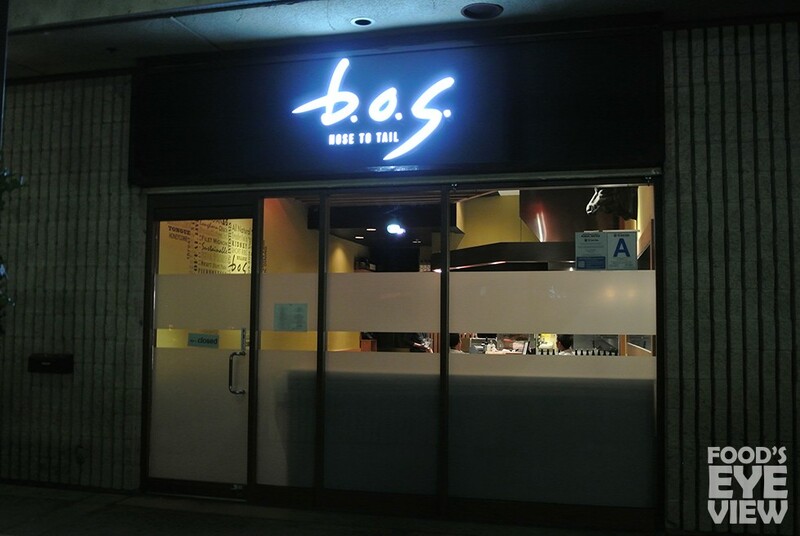 Ran by former Men Oh GM Jun Isogai and Chef David Bartnes, b.o.s. appeared poised to make a name for itself in the crowded downtown dining scene with its beef-centric menu making full use of all the “scrap” parts. Though items like bone marrow and tongue are becoming more and more ubiquitous across Los Angeles menus, Chef Bartnes takes things further by utilizing heart, various intestines, brain, and even a jaw-dropping whole braised oxtail. To my knowledge, Fairfax’s Animal is probably the only other restaurant treating offal with the same revere in an attempt to present them in a more approachable fashion. At the same time, the menu at b.o.s. isn’t limited to the sort of things that would make casual diners cringe with plenty of “regular” pastas, meats (highlighted by A5 Japanese wagyu) and even the requisite salads featuring heirloom tomatoes and burrata. I had been eyeing b.o.s. for some time but always seemed to end up at either Gen, Kokekokko, or Bestia when in the area. Then the news broke of the impending closure and I high-tailed it downtown to squeeze in as many Death Row-esque meals as I could before the restaurant was gone. 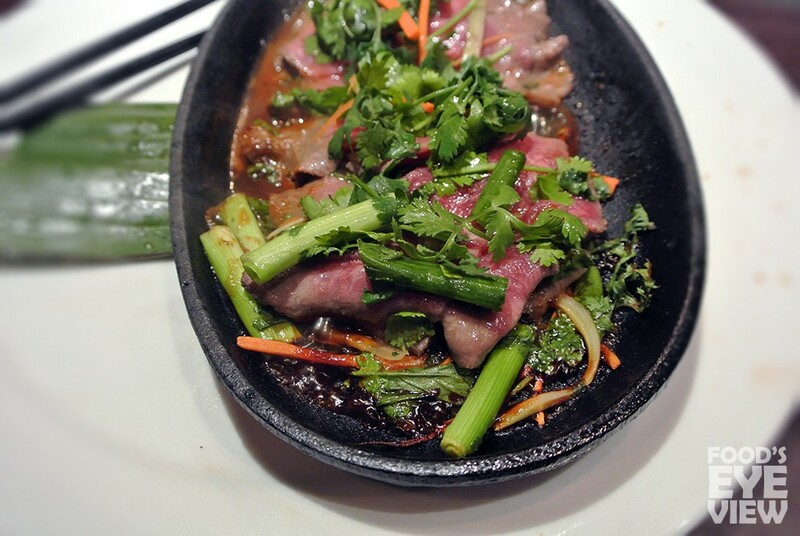 The first dish out of the gate featured thinly sliced beef tongue and an abundance of Thai herbs placed onto a sizzling hot stone plate. The tongue required minimal cooking as it had already been marinated in citrus and was at its best on the rare side, soft with a slight chew. It didn’t carry a ton of flavor on its own aside from the inherent beefiness, but the tangy lime chili sauce and fragrant blend of cilantro and onions did all the heavy lifting. Amid all of the animal parts on hand for the evening a salad was certainly in order. 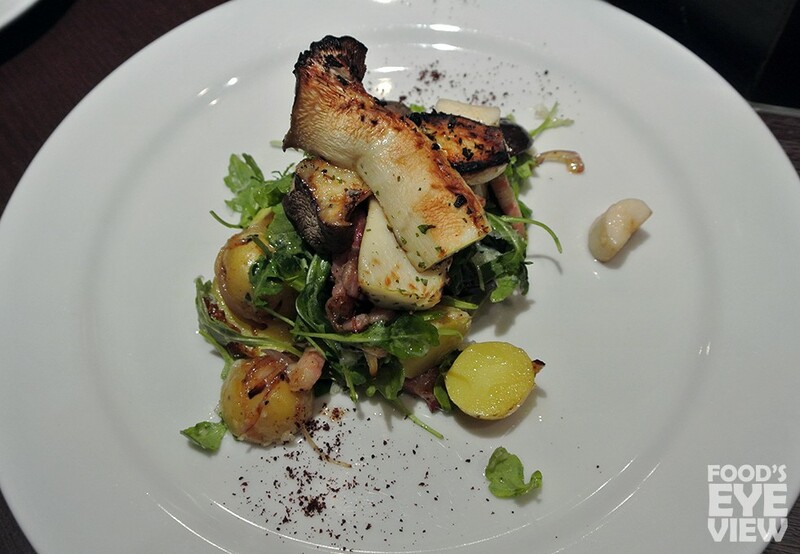 Trumpet mushrooms, plenty meaty in their own right, were grilled until nicely charred, amplifying their earthy taste. Bitter arugula was topped with grated gruyere cheese and tossed with bacon and soft potatoes to complete the salad, while a healthy drizzle of truffle oil added a layer of richness. I won’t go so far as to call this the most surprising bite of the night because really, anything fried is going to taste good, but I wasn’t ready for just how good these crispy, battered guts were. 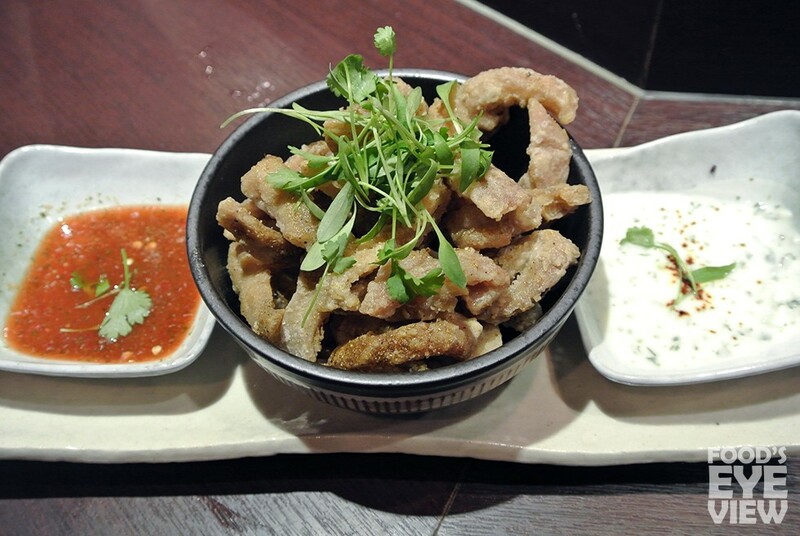 Not too oily and just chewy enough to remind you of their true identity, the tripe and small intestine were addicting on their own but even better with the accompanying sauces: cool and creamy cilantro garlic yogurt and the bright, acidic Isaan dressing. Everyone is using sea urchin these days, but few if any are producing pastas this good with the orange lobes. The homemade fettucine would make any Italian proud, cooked al dente and sturdy enough to hold up under the lush uni-infused sauce. 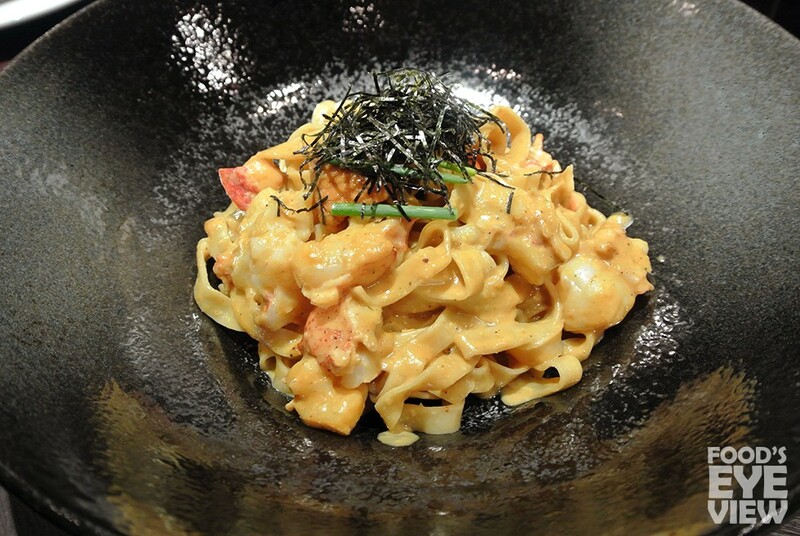 Chunks of lobster and narrow strips of nori added an extra wave of ocean flavors that allowed this dish to shine in the midst of all the meat. This one certainly gives the similar version at Bestia some serious competition. 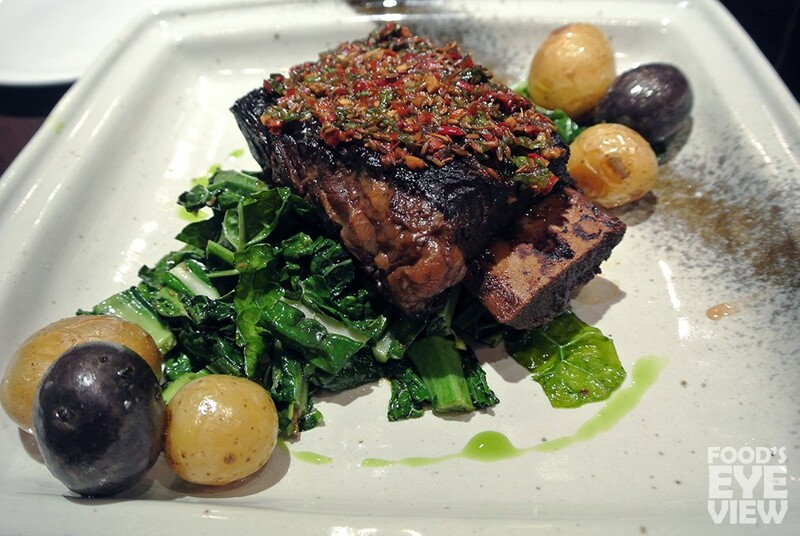 Last but not least was a massive bone-in short rib rubbed with a liberal amount of Hunan spices giving it a distinctly Chinese flair. Offsetting the intense flavors on this monstrous cut of beef was sautéed kale and some poached potatoes giving it a very simplistic, yet satisfying appeal. After a meal as great as this one, the obvious question is why are they closing? Perhaps it was the location, competing with Sushi Gen and Men Oh and with limited visibility and foot traffic. Or it could’ve been the “nose-to-tail” label, intimidating Angelenos not quite ready to embrace the idea of eating a whole animal beyond the familiar steaks and chops. Whatever the reason(s), it’s always unfortunate when the city loses a great restaurant, especially one that brought something different and exciting to the table. I have no doubt that Jun Isogai, Chef David Bartnes and the rest of the team will land on their feet somewhere else very soon because they’re far too talented to be out of a job. There’s still a couple of weeks left to pay them a final (or first) visit so don’t let the opportunity pass before it’s gone for good.